If you could understand. You would take my hand. Arcadia, an idyllic image of life in the countryside, a pastoral paradise and the home of Pan, the half-goat, half-man god of Greek mythology who revels in rustic music and the company of wood nymphs. 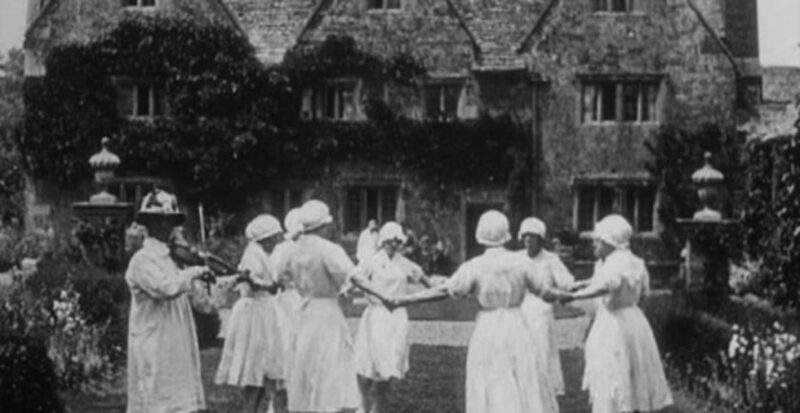 The film Arcadia which, following its cinematic release, is now available in a splendid DVD package from the British Film Institute, is both consonant and dissonant with such associations as it transports the viewer into a strange world of forgotten customs, folk rituals and hidden practices from the last hundred years of British history. 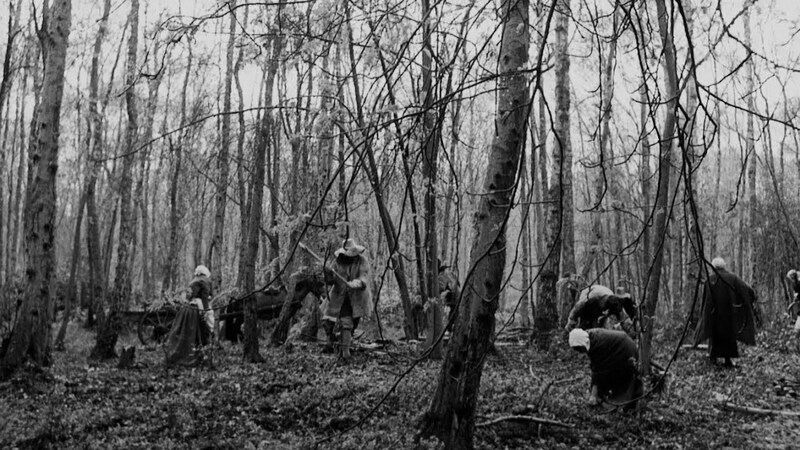 For while many of the bucolic images are indeed delightful, a number of the scenes in this remarkable film surface darker currents and traditions in Albion’s recent past. The publicity for Arcadia proudly promotes the film as offering ‘a visceral sensory journey through the seasons, exploring the beauty, magic and madness of our changing relationship with both the land and each other’. This is an apt précis and Arcadia’s viscerality is indeed undeniable, with joyful scenes of dancing and naked pastoral celebration contrasting starkly with disturbing footage of fox hunting and other blood sports. Also central to the film’s sensory impact is a powerful score by Adrian Utley (Portishead) and Will Gregory (Goldfrapp) which provides dynamism and coherence to the myriad of images that are skillfully woven together by Paul Wright. Arcadia is by various turns naturalistic, dream-like and the stuff of nightmares. Snippets of odd dialogue and disturbing images punctuate the film, disrupting the stream of cinematic consciousness, prompting the viewer to reflect on how our environment and peculiar traditions have come to shape our everyday reality in today’s Britain. While focusing primarily on scenes of a pastoral nature – many of which are quite extraordinary – the film progresses on to depict British life in more contemporary urban settings. The contrast is marked and may jar for some, the viewer is implicitly challenged to reflect on whether the less desirable aspects of British rural life continue to the present day, simply manifesting themselves in new guises. 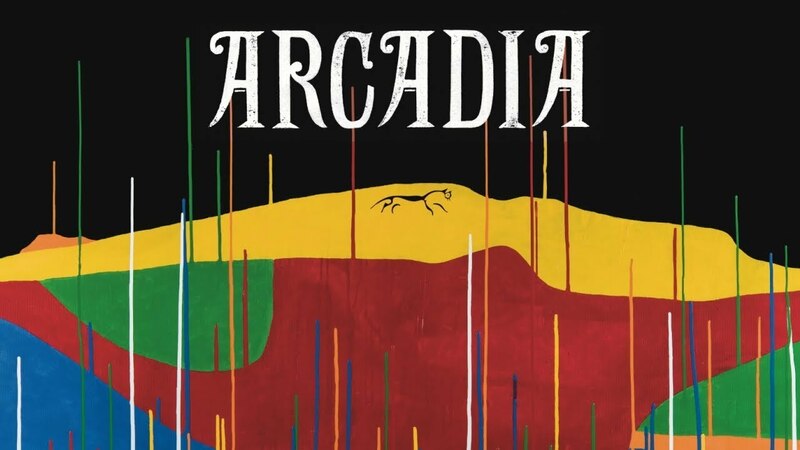 There is much in Arcadia that will intrigue those who are fascinated by the folk horror genre and open to exploring neighbouring cultural fields. Arcadia offers the opportunity to re-visit and reflect on Albion’s peculiar traditions. FHR was fortunate to have opportunity to pose a couple of questions to Paul Wright, Director, and to Adam Scovell, film-maker and author of Folk Horror: Hours Dreadful and Things Strange, who worked on the archive research. FHR: Arcadia unearths a myriad of forgotten customs, delights and horrors from the celluloid history of the British countryside. Which of these made the greatest impression on you? And what do you hope viewers might learn or reflect on, particularly in the social context in which we now find ourselves? PW: Rather than merely showing the chocolate box version of the countryside that is often seen, I was a lot more interested in exploring the more unusual, hidden or forgotten versions of the land. The contrasts of darkness and light, beautiful and horrific, picturesque and the disturbing, along with feeling that different truths were emerging, like ghosts from the past, was integral to the film from the start. On a personal level it was this stranger footage I connected most with. Watching some of the folk customs especially was something of a breakthrough as a lot of the material had this wild, complex energy of being both extremely appealing yet terrifying at the same time. Seeing parallels between some of these rituals and more modern day equivalents was also an exciting part of the process. It was always the idea to leave some space for the audience when viewing the film. The main themes we were interested in exploring were how we connect with the land, how we connect with each other, and what changes there have been between these over the years. It was always the idea that the piece would work as an emotive, sensory experience rather than an intellectual one. Something that became impossible to ignore, and was present one way or another in most of the films in the archive, was the huge inequality in Britain both then and now and how that too has taken on different guises over the years but has, ultimately, remained. It felt right that this became one of the main themes running through the film. AS: The most interesting and exciting footage I watched for the film was definitely a little short M.R. James adaptation made by a local film society in the fifties. I’m not sure how much of it was used in the final film but it was very interesting in itself as it was Whistle And I’ll Come To You and it seemed to foreshadow some of the visual choices of Jonathan Miller’s 1968 version for the BBC. The most horrifying thing taken from the footage was more of an accumulation of watching lots of various different blood sports. There’s so much archive material gleaned from aristocrats’ home movies and obviously one of the chief things they recorded in their day-to-day life was a variety of fox hunting, hare coursing, and various different animal management from the gentry’s farming enterprises. It was a slow, building violence, that started to seep into me every day and solidified for me the frustrating dynamic still virulent today in regards to the countryside being the playground for the rich and their violent habits, even when illegal or endangering species and other wildlife. FHR: How did you go about choosing the material? PW: There was a lot of viewing of material, mainly of the BFI archive and later the regional archives. Pretty early on I sketched a rough structure based around the four seasons. Each season had some themes and buzzwords on what may be useful to look out for and hopefully would give the piece some sort of a narrative and progression throughout. From there it was myself and Adam Scovell watching a lot of footage and marking down any moment, image or sound that was interesting or could be useful down the line. This was a pretty painstaking process, there must have been thousands of notes, but ultimately rewarding to be able to explore such rich material and of course having those moments where you knew you had found something that would be great in the film we were trying to make. It was then about myself and Michael Aaglund, the editor, assembling these various highlights and starting to play around with them on the timeline, still using the rough structure of seasons as a starting place but also being open enough to let the footage itself inspire new ideas. It became a pretty organic process at this stage. AS: I simply worked from Paul’s detailed list of words and themes. Sometimes there would be something that just stuck out simply because it was so odd (a small documentary on a pub that started serving garden snails, for example, which certainly wouldn’t have ticked anything specific on Paul’s list of themes), but mostly it was following Paul’s lead and figuring what would work best for his vision of Arcadia.